These days, most emails you get from major services like LinkedIn or Orbitz are full of rich graphics and other elements that make the message feel more like a webpage than the basic text emails from days of yore. But there’s been a key thing missing: these emails are all static, so their content goes stale. Depending on how often you check your inbox, that hot deal from Orbitz may be long gone by the time you see it, or the movie recommendations from Netflix may already be out of stock. Today, Hotmail is launching a new feature as part of its Active View platform that looks to fix this. The email provider has teamed with a handful of select parters to provide rich, dynamic emails that will update when you open them, and allow you to interact with services directly from your inbox. In other words, they’re making email a lot more like real websites. 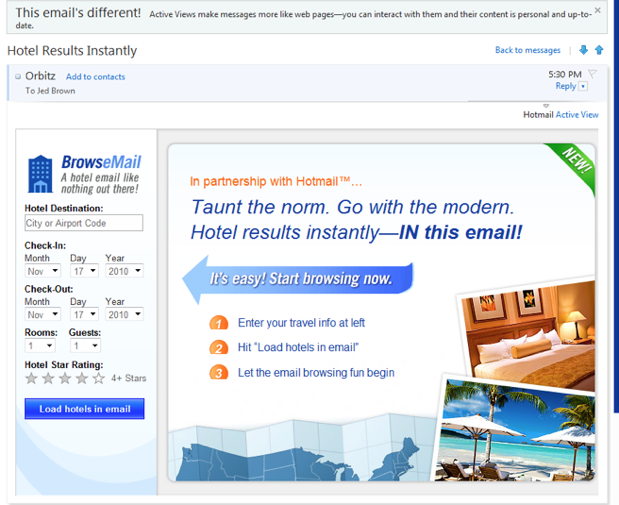 For starters, Hotmail will be offering this enhanced email from four providers: Orbitz, Monster, Netflix, and LinkedIn. Orbitz’s messages will display current travel deals (instead of stale ones that you may have missed), and will also let you search for flights directly from your inbox. Netflix will give you recommendations based on what it has in stock at the time you open the message. LinkedIn will let you approve new work connections from your inbox, and so on. Dharmesh Mehta, director of product management for Windows Live, says that the feature will be rolling out over the coming weeks for the services mentioned above, and that more services will be added early next year. From a technology standpoint, the platform has a few security systems in place to ensure that these rich emails are only coming from trusted parties. The first safeguard is that this system isn’t open to all inbound messages — only trusted services will be allowed to send them. And Microsoft is using OAuth to allow users to directly connect their inboxes to the third parties services they’re interacting with from their inbox. Mehta says that Hotmail will be approaching the other major email providers to talk about turning this into an industry standard, given that it doesn’t really make sense for services like LinkedIn to have to build multiple versions of their ‘dynamic’ emails. It sounds like a cool system that could save time, but I’m not a big fan of the fact that only ‘trusted’ providers will be able to enable this functionality. Sure, it makes sense to help safeguard users against spam, but I can’t help but think that startups looking to get their services in the hands of users will be at a severe disadvantage if their big-name competitor is allowed to offer Active Views, and they aren’t. Hopefully Microsoft plans to open up this system more broadly down the line.